Flexible system for any length of steel angle, bar and tube. Five storage levels designed for manual loading, with horizontal or tilted arms. 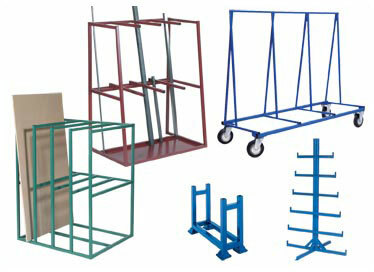 Free standing heavy duty horizontal bar racks with six storage levels for steel bar, tube or sections. Fifteen pigeon holes providing dense storage for mixed bars, tube, strips or sections. Mobile horizontal storage for lengths of bar, tube or other suitable materials. Vertical heavy duty bar storage for instant stock accessibility of bar, angle or tube materials. Vertical storage for instant stock accessibility of bar, pipe, strip, angle or any lengths of materials. For moving sheet, ply, MDF or steel up to 3050 x 1250mm. Five levels of storage of sheet steel or boards. Vertical storage of materials stored in individual bays.